Just like street address, in internet world online computers or 3G smartphones are contacted through internet address, or we called IP Address. When people surf internet through web browsers, network protocols transfer your current address information to the web servers through HTTP messages, by tracking the packet headers and search location database, we can display your true IP, your accurate location and lots other information about you. Any connected computers or network appliances including Windows 8 computers, OSX Mac ultrabook, Ubuntu Linux desktop system, Wireless Routers , Network Storage Devices, iPhone 5/5S smartphones, Android Galaxy S4, iPad/iPad Mini, Android Nexus 7 tablet, Windows Phone 8, computers, Network capable Printers, all have its own globally or private unique communicable address. IP is a network layer protocol in the internet protocol system and is an upper layer protocol upon link layer protocol for example the 802.11 MAC Address based wired Ethernet or Wireless Hotspot network. Every time when you connect to Internet, your Internet Service Provider will assign you an IP address upon connection established, through it other web servers know what you are requesting for and how to send information you needed back to your computers or devices. 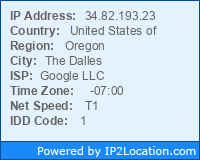 Different countries has different range set of IP addresses, all ISPs and data centers etc. will share these IP pools and in the end distribute the IP among users, that's in the end each individual user get assigned one IP address for smooth web surfing.